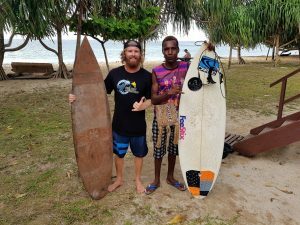 We recently kicked off the Papua New Guinea surf season in Vanimo with our first group from Australia. We had 15 surfers from Sydney, Byron Bay, the Sunshine Coast, Rockhampton and Cairns join us on our PNG surf adventure. It was great to have a few familiar faces with us as some of the boys were on their second, or more, trip with us. We were also once again joined by Linton from Next Level Surf Coaching, who was there to help out with everyone’s surfing skills over the week. We were treated to the left “absolutely smoking” as described by one of our guests before the the wind direction changed and Lido right fired up. The right produced the usual magical, fun waves for the remainder of the trip. Everyone was fully content with plenty of waves surfed by all throughout our stay! During the week we had a few discussions about rubbish lying on the beach and floating in the ocean. We decided to do something about it – a small step to raise awareness amongst the local community. Everyone got their hands dirty and cleaned a good chunk of beach. We were also joined by the local kids, who were extremely eager to help out. After only an hour we managed to gather a truck full of rubbish!! It was a fulfilling way to finish off that afternoon. Special thanks to John, the camp manager for helping us out and doing the dump run with all the waste and hats off to everyone in the group for taking part. It was another great surf trip to Vanimo with a fun group. Already looking forward to our next PNG surf adventure…which is in the works for November. We are planning our next trip to Lissenung Island, an exclusive surf & dive resort located on a tiny, idyllic setting about 30 minutes from Kavieng. Surf, dive, snorkel, relax and even get involved in turtle conservation. Come surfing in Papua New Guinea and enjoy fun, uncrowded waves. Check out our surfing website dedicated to PNG surf adventures.